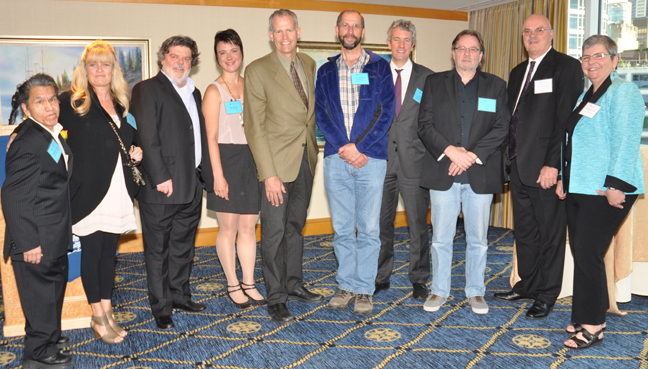 Seen with Chancellor Peter Ufford (second from right) and Cap U president, Dr. Kris Bulcroft (far right), are Capilano University’s 2012 Alumni Award of Excellence recipients (l-r): Stephen Lytton, Tricia Sibson, Rejean Marois, Erin Millar, Martin Littlejohn, Dr. Andrew Derocher, Shawn Williamson and Bill Thumm. 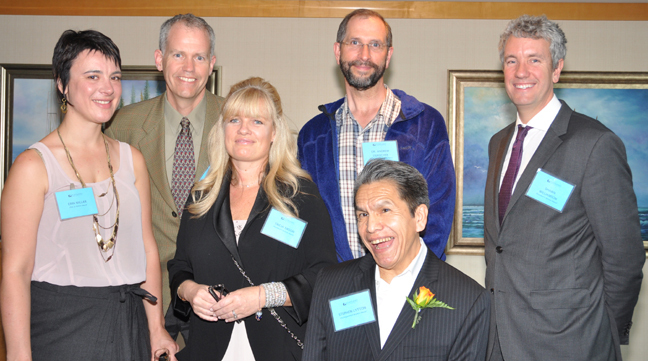 Erin Millar, Martin Littlejohn, Tricia Sibson, Dr. Andrew Derocher, Stephen Lytton (front), and Shawn Williamson were recipients of a 2012 Alumni Award of Excellence at Capilano University. 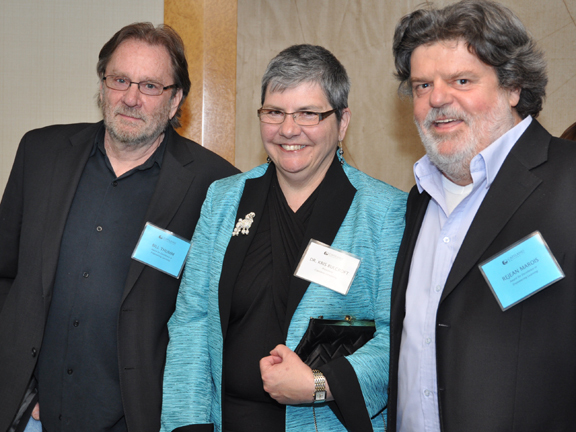 Recipients of an Award of Excellence in Empowering Learning at Capilano University’s 2012 Alumni Awards of Excellence are Bill Thumm (left), director of the Nat and Flora Bosa Centre for Film and Animation, and Jazz Studies instructor, Réjean Marois (right), seen here with Cap president, Dr. Kris Bulcroft (centre). (NORTH VANCOUVER, B.C.) – Nine outstanding recipients were recognized May 9 at Capilano University’s 2012 Alumni Awards of Excellence: World-renowned expert on polar bears, Dr. Andrew Derocher, and social and community activist in Vancouver’s downtown eastside, Stephen Lytton, were recipients of a Distinguished Alumni Award. Tommy’s Restaurant (Tricia Sibson) in North Vancouver and Shawn Williamson, principal of Brightlight Pictures, were recipients of a President’s Service Award. Co-founder and executive director of the Western Canada Mountain Bike Tourism Association, Martin Littlejohn; freelance journalist and author, Erin Millar; and, Cirque du Soleil production manager, Christopher May, were recipients of a One to Watch Award. Longtime Jazz Studies instructor, Réjean Marois, and Bill Thumm, director of the Nat and Flora Bosa Centre for Film and Animation, were recipients of an Award of Excellence in Empowering Learning. A world-renowned expert on polar bears, Dr. Andrew Derocher is also a former chair of the Arctic Institute of North America. With more than 125 published reports to his credit, his work has been instrumental in bringing to light the serious threat of global warming and the importance of habitat conservation. He studied Arts and Sciences at Cap from 1978 to 1979 before acquiring his PhD in Zoology at the University of Alberta. Born with cerebral palsy, Stephen Lytton has determinedly pursued his dreams while making countless contributions to the arts and public service. 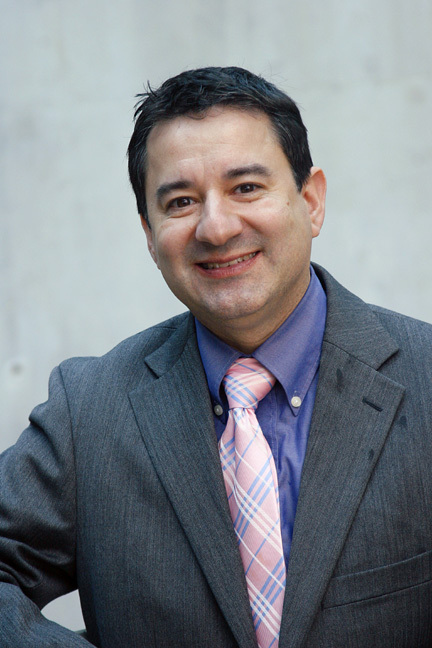 He has been associated with Cap as a student, volunteer and community partner board member since 1997, and has taken a variety of courses offered at the university’s partner site, the Carnegie Community Centre. Actively involved in numerous community affairs, Stephen was honoured in 2012 by Governor General of Canada David Johnston. Tommy’s Restaurant is a North Vancouver establishment that has provided ongoing support to Capilano University’s Access Work Experience programs via placements for students with a wide range of abilities and challenges. Through its enduring and important commitment to Cap’s program, Tommy’s Restaurant has nurtured and helped students gain confidence, self-esteem and the skills necessary to enable success in all of their future endeavours. As principal of Brightlight Pictures, an independent Vancouver television and film production company, Shawn Williamson has been offering groundbreaking internships to Capilano students since 2008. This hands-on real-world experience has provided numerous burgeoning filmmakers with an invaluable opportunity to immerse themselves in Shawn’s environment of passion and dedication, helping them to transition successfully into the film industry. Co-founder and executive director of the Western Canada Mountain Bike Tourism Association, Martin Littlejohn’s passion for mountain biking has forever changed the nature of the activity. A graduate in 2007 of Cap’s Bachelor of Tourism Management program, he is universally respected for his contribution to community tourism development and to positioning British Columbia as the most diverse mountain biking destination in the world. A creative juggernaut, Erin Millar’s passion for journalism led her to co-author The Canadian Campus Companion: Everything You Need to Know about Going to University and College, which was distributed nationwide in 2011. 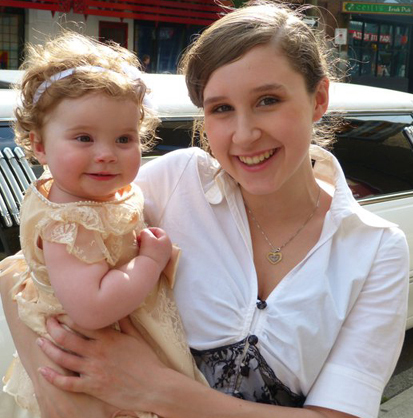 Erin completed her Bachelor of Music degree in 2005 while acting as editor-in-chief of Cap’s student newspaper, The Capilano Courier. She was founding editor of Maclean’s On Campus, and is a widely-published freelance journalist. Since joining Cirque du Soleil in 2009, Christopher May has earned the distinction of becoming the youngest company manager in Cirque du Soleil history. A 2003 graduate of Cap’s Arts & Entertainment Management program, Christopher started his career as a production coordinator for Burnaby’s Michael J. Fox theatre before becoming production manager for the Centre in Vancouver for Performing Arts. Réjean Marois is a unique and creative powerhouse in Cap’s outstanding Jazz Studies program. His unparalleled enthusiasm, intense musicianship and beautiful arrangements have been instrumental in bringing international recognition to Capilano University. An instructor for almost 25 years, he cares deeply about his students and never wavers in working to advance the university and its reputation. As director of the Nat and Flora Bosa Centre for Film and Animation, Bill Thumm was the driving force behind the centre becoming a reality. Highly-respected both in the classroom and in the industry, Bill is known to invest himself fully into the people and the responsibilities before him, with many film graduates attesting that he was a fundamental figure in shaping their futures. (NORTH VANCOUVER, B.C. )—Winning jockey at this year’s Kentucky Derby, Mario Gutierrez, had his teachers at the Learning Centre at Vancouver’s Hastings Racecourse jumping for joy when he crossed the finish line in first place. “I want to thank all my supporters in Vancouver and my friends at Hastings Park,” he gulped between breaths while bouncing towards the winner’s circle atop the race’s fastest horse, I’ll Have Another. When the 25-year-old jockey first arrived at Hastings Park six years ago, his only language was Spanish. He participated in a Spanglish program at the Hastings Park Learning Centre, which is operated through Capilano University’s Community Development and Outreach department. In the program, Gutierrez honed his English-speaking skills and the rest, as they say, is history. The HPLC got its start in 2000 when the Horsemen’s Benevolent and Protective Association contacted Capilano University’s CDO. They highlighted the need for literacy instruction at Hastings Racecourse, which eventually led to the establishment of the learning centre. The centre is the pride and preoccupation of Jeannie Spence, a former jockey, current horse owner/ trainer, and a former director of HBPA. Spence has tutored employees for more than 30 years and was recently recognized by ABC Life Literacy Canada with the 2011 Dr. Alan Middleton Workplace Literacy and Learning Award. 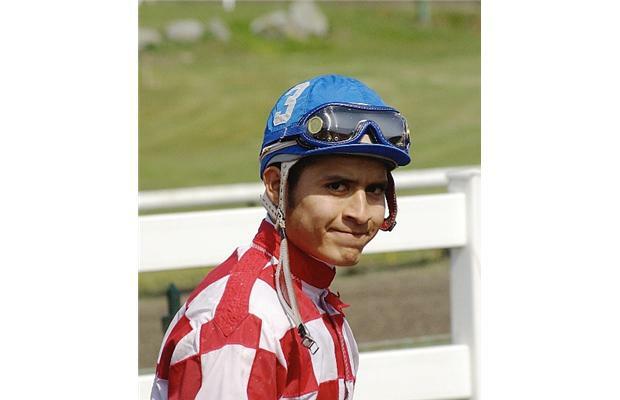 Frank Fuentes is another jockey at Hastings Park who has benefitted from the learning centre. Originally from Mexico, Fuentes improved his English as a Second Language skills to better communicate with the owners and trainers about their horse before a race. The centre also provides racetrack staff an opportunity to access another new on-site learning venture called the Hastings Racecourse Groom School. Groom School is an intensive two-week program that teaches participants how to properly care for and groom thoroughbred horses. Once accredited, a groom can work almost anywhere in North America. Other courses offered through the learning centre include a Grade 12 equivalency program and a new Adult Basic Education program, plus courses in art, yoga and first-aid. Many students of the centre have gone on to attend university or trade schools. In addition to jockeys and grooms, the centre also caters to hot walkers, exercise riders, blacksmiths, various front-side people, such as tellers and hospitality staff, and workers from the Pacific National Exhibition, where the track is located. Their children are also welcome to attend. It is open seven days a week from noon until 10 p.m. More information on Capilano University’s CDO department can be found here. (NORTH VANCOUVER, B.C.) – Youth poverty, gender-based bullying, sustainable energy: three young Change Makers from Africa will discuss success stories from their own work in Kenya, Uganda and Sierra Leone and how the lessons they’ve learned might apply to the same problems we face here in British Columbia. Turning development on its head will be held at the North Shore Credit Union Centre for the Performing Arts at Capilano Universtiy on May 14. Refreshments for the free event will be served at 6 p.m., with the keynote and panel discussion running from 7 – 9 p.m. The event, supported by the the Canadian International Development Agency, is open to the general public. The Centre is located in the Birch building at Cap U’s North Vancouver campus located at 2055 Purcell Way. The keynote speaker will be Evans Wadango, an engineer from Kenya, named one of CNN’s top 10 heroes for 2010, who – along with Ted Turner and Tim Berners-Lee, the inventor of the World Wide Web – received the inaugural Mikhail Gorbachev “World Changer” award last year. Wadanago and Daniel Ahimbisibwe from Uganda, and Esther Kanu from Sierra Leone will then join alumni of Capilano University’s Global Stewardship program and other Canadians working in Africa for a panel discussion, followed by Q&A. 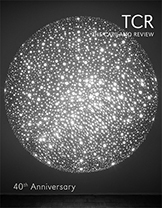 TCR’s issue 3.17 celebrates the literary magazine’s 40th anniversary with wide-ranging work – poems, narrative, plays, a novella, a sit-com – by Daphne Marlatt, Steve McCaffery, Garry Thomas Morse, Stan Persky, Sharon Thesen, Fred Wah, and many more, plus Kim Minkus’s interview with Maxine Gadd. The issue also features a visual art portfolio with work by Pierre Coupey, Christos Dikeakos, Liz Magor, Jin-me Yoon, and more. Visit the Capilano University Bookstore to get your copy! In addition, TCR will be holding a special event and reception at Performance Works on Granville Island on May 16, featuring readings by Steve McCaffery, Maxine Gadd, and Garry Thomas Morse. Plus Carol Sawyer and musical guests. Doors open at 7 p.m. Tickets are $10, available via Tickets Tonight, or $12 at the door. (NORTH VANCOUVER, B.C. )—Capilano University has begun offering English as a Second Language courses at no charge to Canadian citizens. Cap joins 16 other post-secondary institutions in British Columbia that have also started providing free ESL courses. English as a Second Language (ESL) programs provide language instruction at basic, intermediate and advanced levels to people whose first language is not English. “We want to make sure all British Columbians have the adult education opportunities they need to find jobs, raise families, participate in their communities and fulfil their dreams,” said Naomi Yamamoto, minister of advanced education. Under the Canada-B.C. Immigration Agreement, ESL courses are being provided tuition-free to new immigrants, such as permanent residents. As well as ESL in the 17 public post-secondary institutions, this includes WelcomeBC’s English Language Services for Adults (ELSA) program in communities throughout the province. The province is extending this tuition-free policy to Canadian citizens at public post-secondary institutions, ensuring that they have access to the same opportunities as recent immigrants. The Ministry of Advanced Education will also continue to provide financial assistance to ESL students with a demonstrated financial need under its Adult Basic Education Student Assistance Program (ABESAP) to help with associated fees, books, transportation, child care and other costs.